I’m not exactly doing the Android a great service by talking first about all the applications you can get for the iPhone. But I’m still optimistic about the potential for the Android platform. Because it’s built on the Linux kernel, because Google has open-sourced nearly the entire platform, because Google is taking a far more open, developer-friendly approach, and because Android will run – license-free – on almost any hardware, there’s no reason to doubt the Android has a lot in store in the future. That said, it’s not the distant future in which you’re interested. What can you get in the short term? With the current SDK, the answer is simple: not much. The Java-based developer tools initially released for the Android are great for building various kinds of mobile apps, but they fall short for anything creative or audio-related. I think they deserve some patience: Apple took a long time to release any SDK at all, and Android out of the gate includes features still lacking on Apple’s platform. The bad news for musicians is, it’s features like real-time audio capabilities that are lacking. Fortunately, Google has a new 1.5 SDK (“Cupcake”) available in previews now, which should push out to devices very shortly. Briefly, this includes features that allow better audio performance and functionality, plus a full-blown environment for dynamic and responsive music unlike anything seen even on the iPhone. JET from SONiVOX (yes, the folks who do sample libraries) is the best part of this. 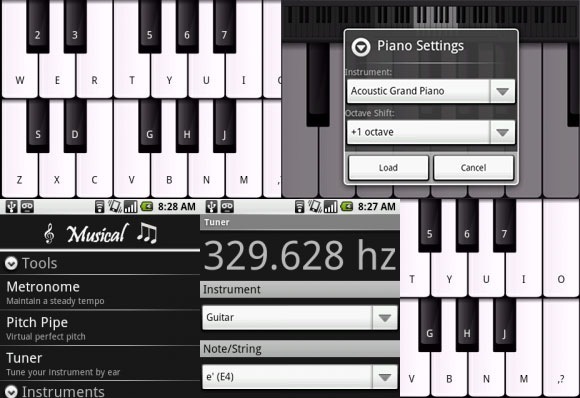 I’ve talked to the SONiVOX folks, and you can even expect some desktop tools to make creating dynamic music easier. It’s more like a music engine for games than a music tool, per se, but a) it should allow brilliant game scores and b) I think we can warp it to other uses, as well. And there’s already at least one app that starts to develop the potential of musical applications, called – conveniently enough – Musical. I hope to do a full preview with them soon. Christopher’s own work demonstrates this in practice. Yes, you can get more than one touch on the one currently-available Android in North America, the TMobile G1. The problem is, HTC’s G1 isn’t very good at multi-touch. You can get two fingers, not five as on the iPhone. And if your fingers are too close, it doesn’t work. My guess is, Google is working as fast as they can, prioritizing whatever is the greatest immediate need. (Novel concept.) If a handset carrier can ship a device with real multitouch capabilities, you can bet multitouch will show up in the SDK. And there’s no reason to believe handset makers (or even netbook makers) won’t do just that. There are already sophisticated multitouch solutions from the likes of HP, so Apple is extremely unlikely to permanently corner this market. Of course, the flipside of this is that multi-touch just isn’t all that interesting on the G1 – probably not worth hacking your phone, even. I love multi-touch, but given how small mobile devices are to begin with, and how many lovely multi-touch apps are already available on iPhone, I’m personally interested in exploring more single-touch gestures and interface design. Nothing earth-shaking – it’s very similar to the early days of iPhone music apps – but there’s every reason to believe that deeper apps could come soon. Oh yeah, and I have an Android of my own now and am working on some development experimentation. So why I am writing this? I need to get back to coding.